SURPRISE, Ariz. – On a Sunday, in the Phoenix suburb of Surprise, state legislator Steve Montenegro stands behind the pulpit and preaches with confidence. An audience of about 40 people, mostly Latino, listens to him attentively as he punctuates every sentence with a wide smile. In his second term in the Arizona state legislature, the 29-year-old immigrant from El Salvador is the only elected Latino Republican in the Arizona House, and politicos on both sides of the aisle view him as a rising Republican star. Montenegro, who is running for re-election in 2012, is the product of a national effort by Republicans to recruit and train more Hispanic candidates for office – including Florida Sen. Marco Rubio and New Mexico Gov. Susana Martinez – because they say Latino voters are shifting to the right. Montenegro said he never mixes politics with his role in the church and vice-versa. But his family’s church, the name of which he asked not to be mentioned in this article, has been an integral part of his life. He grew up looking up to his father, a Pentecostal pastor, speaking Spanish, and watching immigrant families like his struggle to make ends meet. This is precisely why he thinks he doesn’t need to try hard to understand the mindset of Latinos. In an interview at a local coffee shop, Montenegro says he gives voice to conservative Latinos with strong family values and prudent economic views who are tired of the hypocrisy of politicians from both parties. He says he is on a mission to fight stereotypes held by many, including some fellow Republicans. “(Latinos) would rather be in the sun on top of a roof in Arizona, 120 degrees, working hard, than showing up to the welfare office,” he said. Montenegro, a brown-skinned man with short dark hair, has the demeanor of a meticulous businessman: calm, soft-spoken and extremely measured when talking to reporters. He says he is satisfied with his current political career and doesn’t have his eye on a specific political post. Where his career goes “is going to be up to the voters and up to God,” he said. By “freedom,” he means less big government. And by “being free,” he means taking responsibility and working hard. “People love the fact that when I tell them, ‘I really stand against government oppression and big government,’ they believe me. Because I was born in El Salvador, my parents have seen what a big oppressive government would do to you,” he said. Montenegro’s family arrived in Los Angeles when he was four years old. He is uncomfortable discussing his immigration history, which has long drawn the curiosity of many Phoenix Latinos. El Salvador was in the middle of a civil war when Montenegro and his family immigrated. His family did not seek political asylum or a church sponsorship, he said. Instead, he said, his father applied for legal residency through a family member who already lived in the United States. At the time the family immigrated to the United States, Montenegro’s father was a pastor in the Iglesia Apostólica de El Salvador, a growing denomination of Pentecostals in Latin America. His family lived in Colorado, Michigan and Canada throughout his childhood, until they settled in Arizona and his dad began pastoring in a church in Surprise. Montenegro remembers learning English in kindergarten, but Spanish was the main language spoken at home. That didn’t prevent his family from wanting him to assimilate with non-Latino cultures, he said. Growing up, Montenegro took jobs to help the family. When he was 14, he worked for a few weeks helping with yard work with some people from the church, but said he had to quit because he couldn’t take the extreme heat of Arizona. At another point he got a job as a busboy. He became an assistant youth pastor to his father. He spent five years as president of Arizona Messengers of Peace, a group within the Apostolic Assembly that provides counseling and guidance for youth. But he had his heart set on becoming an attorney. He graduated from Arizona State University with a degree in political science and took an internship with Republican Congressman Trent Franks, thinking he could get a letter of recommendation from him to go to law school. His eyes grow teary as he remembers his father’s advice when he was studying to take the LSAT. He did well on the test, but politics found him before he started law school. He was recruited by a Republican political consultant during a luncheon in February 2008, where his boss Franks was a keynote speaker. The consultant, Constantin Querard, president of the political consulting company Discessio, LLC, says he immediately saw something in Montenegro. “What you see in someone like Steve -- because I try to recruit more minority candidates in the Republican Party, it’s the right thing to do, particularly with Latino voters; their natural tendencies in so many issues line up so well with Republicans -- the problem is that we don’t have a very good messenger…and we have almost no one who can deliver the message in Spanish,” he said. Querard said that people like Montenegro help fight against negative and incorrect stereotypes about the GOP, especially when it comes to immigration issues. Montenegro has risen quickly through the ranks in the state legislature and is currently the speaker pro tempore. He is the candidate that Latino Republicans like Haydee Dawson were looking for. Alice Lara, a spokesperson for the Arizona Latino Republican Association (ALRA) and host of the talk show Radio ALRA on KKNT 960 AM, agrees. She said Montenegro also offers Latino Democrats who are pro-life and conservative someone who aligns better with their values. But not everyone is buying into the new, browner image of the Republican Party. Gallardo points out that Montenegro wouldn’t win in a district like his, where the majority of voters are Latino. He said it is mostly white conservative voters who have given Montenegro support. Latinos represent nearly one-third of Montenegro’s district. With a total population of 378,298, Montenegro’s is the largest district in the state, according to the 2010 Census. “I don’t care what his last name is; he is not representing Latinos,” said Gallardo. Querard said people on the left wish politicians like Montenegro would go away because they destroy their argument that state immigration policies are driven by an anti-Latino sentiment. Before Arizona’s immigration law SB 1070, Montenegro supported a number of other controversial initiatives that put him in the eye of the storm. He was the sponsor of HB 2281 to ban ethnic studies classes, arguing that they promoted the overthrow of the American government. The bill, signed into law by Gov. Jan Brewer, is being used to try to dismantle a specific program in the Tucson Unified School District that focuses on Chicano studies. Montenegro was also the major force behind a ballot initiative in Arizona to end affirmative action, which resulted in a decrease in funding for women’s education programs. He said he gets frustrated with the argument that all Latinos’ views are monolithic or are pro-illegal immigration. At his office at the State Capitol, he reads aloud an email in Spanish that was sent to him by a woman who identified herself as a legal immigrant in the border town of Nogales, Ariz.
She writes that she supports SB 1070 and goes on to say that she sees with sadness that the underage gang members in her son’s school are the children of “illegal immigrants.” A letter read by Republican Senator Lori Klein on the Senate floor sparked controversy earlier this year by drawing a similar comparison. Montenegro’s perfect Spanish has made him a virtual spokesperson for SB 1070 on the Latino airwaves, fielding questions that it would lead to the use of racial profiling against dark-skinned people. “This is an issue that every country deals with. For people to automatically say this is a racist issue, I feel that is wrong,” he said. Montenegro says SB 1070 has been widely misunderstood. It didn’t create a new immigration standard, but would have made police enforce the federal immigration laws already on the books by bringing uniformity to police enforcement, he said. Several federal judges disagreed with Montenegro’s assertion by enjoining most key provisions of SB 1070, saying the state law intrudes into federal immigration enforcement. Montenegro doesn’t think the immigration system is broken. He says he would be open to increasing the number of visas available for people to come to this country legally, and review the costs and expedite the process for those who have been waiting for many years to migrate. But he says he doesn’t support any form of amnesty. Montenegro doesn’t see a solution in legislation like the DREAM Act, a bill currently in Congress that would create a path to legalization for young people who came into the country before the age of 16 and have enrolled in higher education or the military. “I think it’s biased to be thinking of one group of people only, when 20 years from now you’re going to have the same problem,” he said. He said Latinos should be outraged at Obama for not fulfilling his campaign promise of tackling immigration reform and then trying to blame the failure on Republicans. Montenegro says he wants it to be clear that as a politician he doesn’t speak for the church. No matter how much he has tried to keep the two separate, his connection to the church came under fire last year. Carlos Galindo, a political commentator for the Christian station Radio KAZA 1290 AM, said he has gotten several calls from upset people who claimed they were undocumented members of his church and said they had helped pay for Montenegro’s education. Montenegro categorically denied those allegations, saying he got funding for his education through scholarships, loans and help from his family. “At church we never ask people what their status is,” he said, adding that politics are not part of the conversation either. An undocumented immigrant who claims to be a former member of the church spoke on condition of anonymity. 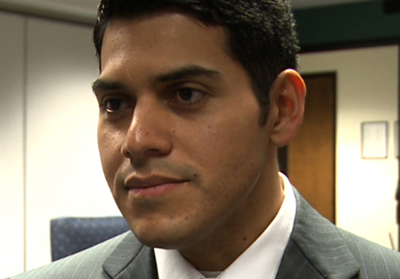 Montenegro said when he took a stance in support of SB 1070, he didn’t do it as a minister or a pastor. “I did it as a legislator,” he said. “You can’t unite the two things. At church is not about politics. It’s about salvation." “The reason why we are, the reason we live, is to serve Him,” he says from the pulpit, as people burst into applause. VIDEO, Phoenix New Times, Sorry, John McCain, Wallow Fire Suspects U.S. Citizens Confirmed - Watch VIDEO John McCain saying "there is substantial evidence that some of these fires are caused by people who have crossed our border illegally"
John McCain blamed the biggest forest fire in Arizona History on illegal immigrants - he then offered absolutely no evidence to backup his claim that brown people were guilty. The suspects in custody are as American as Apple Pie. This is a Historic Blunder of John McCain !! Remember earlier this year when Arizona Senator John McCain said "there is substantial evidence that some of these fires are caused by people who have crossed our border illegally. "They have set fires because they signal others, they have set fires to keep warm, and they have set fires in order to divert law enforcement agents and agencies from them," McCain said. "The answer to that part of the problem is to get a secure border." That's right, seemingly referring to the Wallow fire John McCain blamed a forest fire on illegal immigrants -- and he's not even running for office. Following McCain's comment, remember when he then offered absolutely no evidence to backup his claim that illegal immigrants were to blame for the largest wildfire in Arizona history? That happened, and there's a reason: illegal immigrants didn't start the fire -- a couple of white guys named Caleb and David Malboeuf, cousins, are suspected of starting the blaze. The Department of Justice confirms to New Times that both Malboeufs are U.S. citizens -- they live in the Flagstaff area.